Editors note: B-Roll of a AAA inspection is available here. AAA has unveiled 121 hotels nationally that have earned the AAA Five Diamond Rating in the past 12 months, qualifying them for this year’s Five Diamond award list. Honorees run the gamut in beautiful physical attributes and continue offering technology to enhance service, including in-room tablets, mobile apps, interactive kiosks, mobile keys and digital messaging. Of the 121 hotels, 13 are located throughout Southern California. The hotels receiving a AAA Five Diamond rating undergo several checks and balances including in-person inspections, anonymous overnight stays and finally, review by a panel of experts to ensure credibility. Fewer than half of one percent of the more than 27,000 AAA Inspected and Approved hotels received the Five Diamond rating. The Automobile Club of Southern California also announced the AAA Four Diamond Award® list of 107 hotels for the Southland. 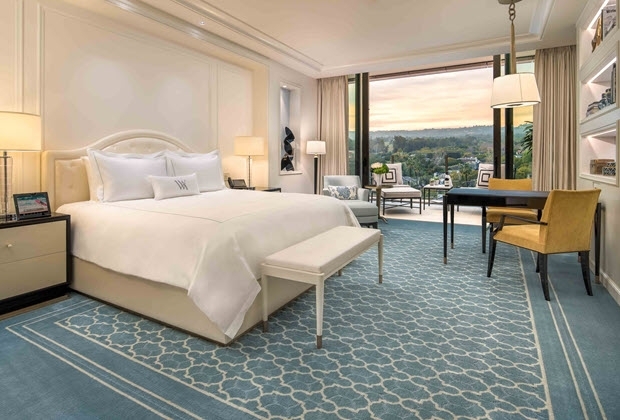 Ten hotels received their first AAA Four Diamond rating: the Waldorf Astoria Beverly Hills, westdrift Manhattan Beach, Autograph Collection, The Sheraton Los Angeles San Gabriel, the Sheraton Universal Hotel, at Universal Studios, and Kimpton La Peer Hotel. The AAA Diamond ratings provides consumers with the broadest coverage of any rating system, geographically and by number of properties rated, including the U.S., Canada, Mexico and the Caribbean. The coveted AAA Four Diamond Award is presented to hotel general managers to recognize award-winning properties inspected by AAA and the Auto Club, the nation’s largest AAA affiliate. To achieve AAA Four Diamonds, the lodging establishments must be “refined, stylish with upscale physical attributes, extensive amenities and a high degree of hospitality, service and attention to detail,” according to AAA Diamond rating guidelines. Inspectors review and rate exterior, grounds and public areas, room décor, ambiance and amenities, guest room, bathrooms, housekeeping and maintenance, management and staff and guest services. Once the inspection is complete, properties that meet all requirements receive a rating of one to five Diamonds.